The Fellowship was fortunate enough to obtain a copy of TWELVE DEVILS DANCING #1 from Action Lab Comics’ Danger Zone imprint. Erica Schultz writes, Dave Acosta draws, Andrew Covalt colors, and Cardinal Rae letters. Cal was an FBI agent who brought down a heinous serial killer called the Crypto-Killer. Now he’s retired for medical reasons. And there’s a problem – now that the killer is on death row, the murders have started again. And Cal is getting phone calls from the real killer, who is taunting him into coming out of retirement to chase him down. This is a triple-sized first issue, and it’s absolutely packed with backstory and character building. We learn a lot about Cal’s past, and just maybe some of it might come back to haunt him here. And Aisha, who I can’t describe without spoilers, is a total badass. This is a very cool crime thriller story, and the art is amazing – it practically bleeds with intensity. There’s a ton of great story here, and Cal is a great example of a flawed hero (in more ways than one). The suspense build is working in this issue, and I can’t wait to see Cal figure this out or to see Aisha in action. Go get this book. 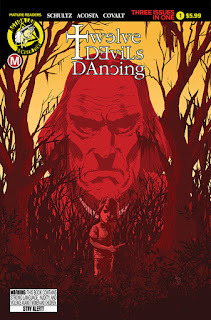 TWELVE DEVILS DANCING #1 is available now from your local comic shop, or online at actionlabcomics.com.